Tina posted on Facebook a few weeks back looking for a show of hands for this trip. Some folk have confirmed and some are a maybe for now, the good new is; we have enough to officially call it a party weekend! This post is for the details of accommodation, prices and how to pay. We have provisionally booked the hostel for the Friday, Saturday & Sunday night, but it’s only being held for a limited time. We need you to confirm how may nights you’ll be staying and payment by Monday 1st October – please no later! Costs – Friday £27, Saturday £27, Sunday £12 (this includes a £9 discount per person as the club has a YHA membership). So, £54 if staying Fri/Sat, £66 if staying all 3 nights. How to pay – To make this as simple as possible for everyone, we have decided to not use Webcollect and ask you to pay directly into the club bank account. It’s the same account number and sort code you would have paid your membership fee to but here it is again. Account # – 00875203, Sort Code – 80-07-24. Please use Tina40 as the reference so we can cross reference the payment. Remember – payment no later that Monday 1st October please – we need to pay the hostel in full shortly after this date. Any payments or bookings after this date, will need to be done directly with the hostel and you may not be eligible for the £9 discount from the YHA Club Membership, so get booked up ASAP! I’ll copy this link to Facebook so we don’t miss anyone out. Enjoy your trip! 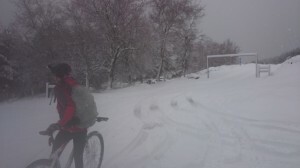 As a bit of a challenge and Strathpuffer training me and Robin decided to tackle the Rob Roy Way (http://www.robroyway.com/ ) in a one-er. It seemed possible – 124km of mostly good tracks from Drymen up through the Trossachs and Bredalbane. The target was the 8:30pm train home from the finish in Pitlochry. Cheap advanced tickets were confidently purchased. We planned for a 7am start in Drymen so it would involve quite a bit of riding in the dark. Beinn Dearg and Carn a Chlamain – hitting the new trail jackpot!